One of the best parts of being home? Our huge, wonderful, fabulous kitchen!! (I may be exaggerating. But you would understand if you saw my sad little kitchen in my apartment. My KitchenAid mixer is on top of my fridge and never gets to be used.) This means I got to actually bake something while I was home, and immediately decided on Thanksgiving breakfast. But I wanted to do something that would be super easy, so I wouldn't miss any of the parade (priorities, am I right?). 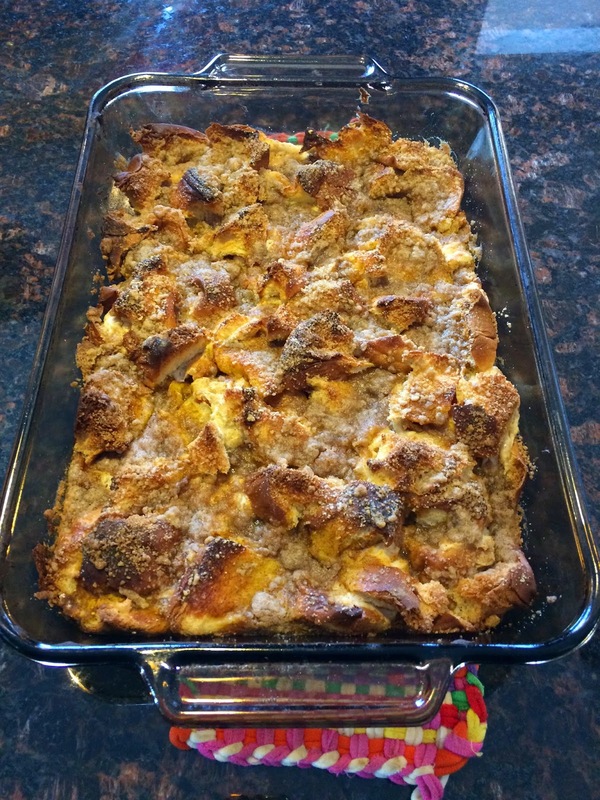 Enter the overnight french toast casserole. Made most of it the night before, left it in the fridge overnight, and all I had to do in the morning was make a crumb topping and pop it in the oven! Easy and it tasted yummy. Win. Lightly coat an 9x13 baking dish with nonstick spray. 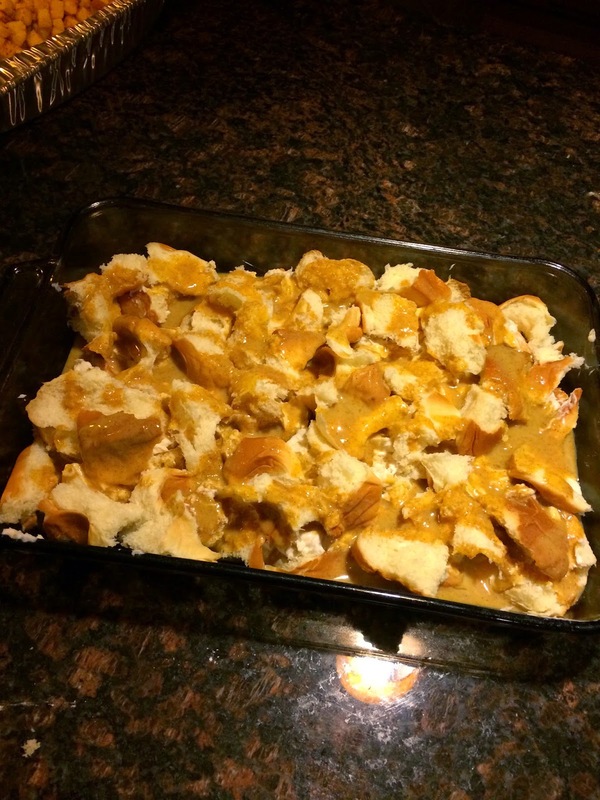 Place a layer of bread cubes evenly into the baking dish. Pour half of the pumpkin puree mixture evenly over the top. Spread cream cheese filling in an even layer. (if you can actually spread in an even layer, you're a magician. I had my dad help me just dollop it over all of the bread) Top with remaining bread cubes and pumpkin puree mixture to completely cover the filling. notes: I would add pumpkin pie spice to the crumb topping and the cream cheese filling as well next time, just to get that added extra note of pumpkin. And be careful of cooking times. The top will get a nice crust, but make sure to check the middle as it definitely cooks through a little slower. A 9x13 is called for, but you could easily use a slightly smaller one, or add a couple more rolls to the mixture. OMG yum! This seriously sounds delicious! This looks sooo yummy!! I definitely need to try this recipe out! Ummm how did I not know this existed?! YUM! I can attest to the fact that it was FANTASTIC! I ate the last piece this morning!